Convert EML files to Outlook PST format, convert EML and MSG files into other popular formats, such as RTF, TXT, EML, MSG, TNEF and HTML, import email files into Outlook. EML to PST Converter is an affordable, fast and easy to understand and use tool that will help you convert EML to Outlook and transfer emails from all major formats and email applications to Microsoft Outlook’s generic PST format. The easy way to convert msg and eml files to pst. Since email became a universal and commonly available method of communication, there has been an incessant competition between email applications and platforms. Each new player on this market strove to cover what its competitors failed to address in their products to make the process of creating, sending and receiving emails as natural, fast and comfortable as at all possible. Their efforts were quite successful – today, we have dozens of excellent email exchange applications that provide everything you need to communicate with the world: from sending and receiving emails to creating complex collaboration environments that enable you to share information and efficiently communicate with colleagues, friends and family members located across the world. Despite the number of choices available to users today, the market is clearly dominated by Microsoft’s products – Mail, Outlook Express and especially Outlook. Being one of the key elements of the Microsoft Office package, Microsoft Outlook is without doubt one of the most popular and versatile email clients. The capabilities of this application span far beyond exchanging emails. Microsoft Outlook can be used for managing daily tasks, scheduling business meetings and personal appointments, keeping notes, storing details about thousands of contacts – in other words, it provides everything you would possibly need to manage your time and communicate with business partners and friends. That’s what makes Outlook so attractive and that’s why so many people choose it as their number one email client after trying their luck with alternative solutions. Given that at least one of Microsoft’s products is included into each installation of Microsoft’s operating systems or the Microsoft Officesuite, we are talking about hundreds of millions of systems using these applications. This situation would’ve been totally perfect if these tools (and all other email applications) were using the same format to store email messages and other relevant information. Unfortunately, they do not, and this fact creates several problems for millions of users who eventually end up having to convert eml to Outlook. A number of EML to Outlook conversion tools available on the market today may help you with some of these tasks, but may not necessarily keep your existing directory structure or transfer attachments along with your emails. Other potential problems include file size limitations, number of supported formats, encoding conflicts and more. So is this a truly hopeless situation? Can anything be done to facilitate the migration of emails (EML to PST) from other email applications into Microsoft Outlook? Is there a painless way to get rid of your current email client, import EML to Outlook and smoothly switch over to this great email program? If you upgrade to a new operating system, it may not necessarily support your email client. This is the case with Windows 7, for example. Users upgrading to this brand-new OS were surprised to find that it no longer supported Windows Mail they were using in Windows Vista and thousands of their emails in the *.eml format could not be immediately accessed and used. They did get an option to purchase Outlook as an extra, but their emails still could not be migrated into it in a simple manner without EML to PST conversion from Windows Mail to Outlook. If you decide to switch from Outlook Express to the much more powerful Outlook, your messages will not be transferred automatically, so you’ll definitely need an EML to PST converter. If you change your computer and/or operating system or decide to stop using alternative email applications, such as Vista Mail, Thunderbird, The Bat, Eudora, IncrediMail, Entourage, Apple Mail and others, you still won’t be able to transfer your emails to Outlook due to format differences and will have to deal with this problem somehow convert eml to msg, import eml to pst – in other words, import eml to Outlook. If your Outlook data file is damaged, you can use one of the available recovery tools, but the result is very likely to be a huge array of *.eml files that you will need to convert into a single data file again (convert EML to PST). And since Outlook does not support the *.eml format, you’ll have to look for a solution to convert EML to Outlook. The answer is yes! EML to PST Converter is the ideal tool for converting email files created by various email applications into Outlook. This EML to PST converter is extremely versatile, flexible and fast, which makes it a real time-saver and allows you to completely forget about problems usually associated with large-scale migrations of emails. Supporting plenty of advanced conversion options, it will take good care of your email archive, no matter how large it is. 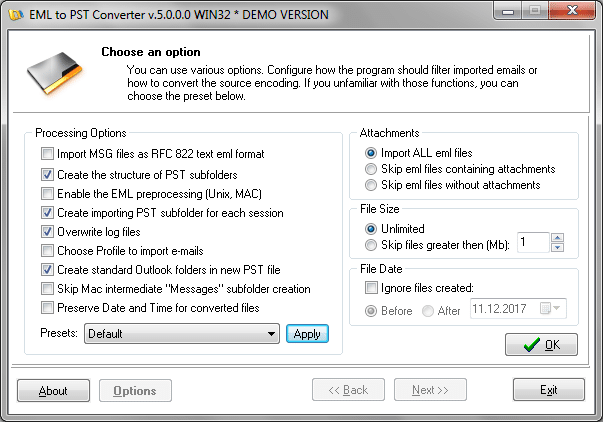 The program can convert EML files into the MSG format and vice versa (in case you only need to convert specific emails instead of the whole archive), convert EML and MSG files into other popular formats, such as RTF (Microsoft Word), PST, TXT, TNEF and HTML, convert .MBOX or .MBX files into .EML and then to .PST and a whole lot more! Import EML, MSG, VCF and other files into Outlook profile. 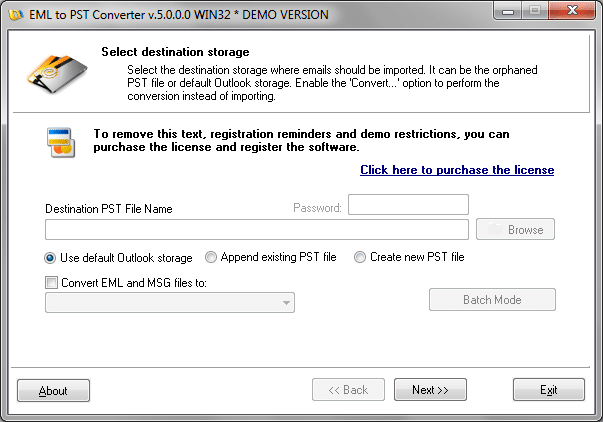 Convert EML to Outlook PST follow personal storage files. Possibility to import archived email messages saved by other programs. Support of EML to PST conversion, EML to MSG and MSG to PST conversion. 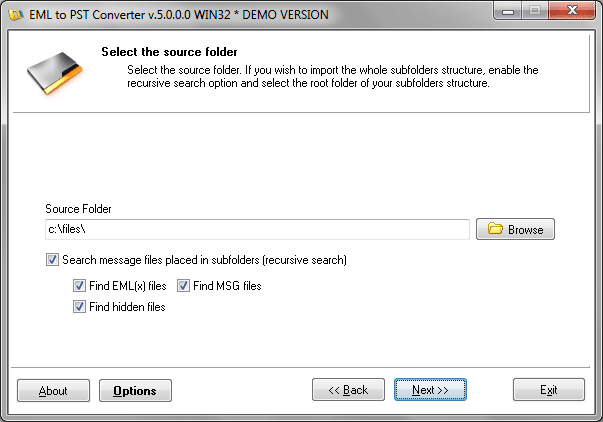 Option to create the nested subfolders structure or import of all messages into a single folder. Preserving the folder structure while importing files into MS Outlook. Suport any type of MSG files, binary and RFC 822 format. Advanced message pre-processing options for emails saved on Unix and MacOS systems. Installation package includes a free mbox to eml converter. I’ve got a new computer with Windows 7. It doesn’t work with my old email-program “Outlook Express”. Now I use Outlook, but with this program I can not open all my emails. So I found your program, and I can only say, it works great and fast.I convert all my older mails, I had no problems. I’m really happy, thank you so much!!! This software was a lifesaver! I had an old iMac with OS 9.2 on it using Outlook Express for Mac. It had 3GB of emails. I imported everything into Apple Mail (on a newer Mac with OS 10.4) and then everything from Apple Mail onto a directory store on a Windows PC. I then used EmlToPst to combine all the emails (thank god it retained the folder structure) into a usable .PST file for MS Outlook 2007 on Windows 7. 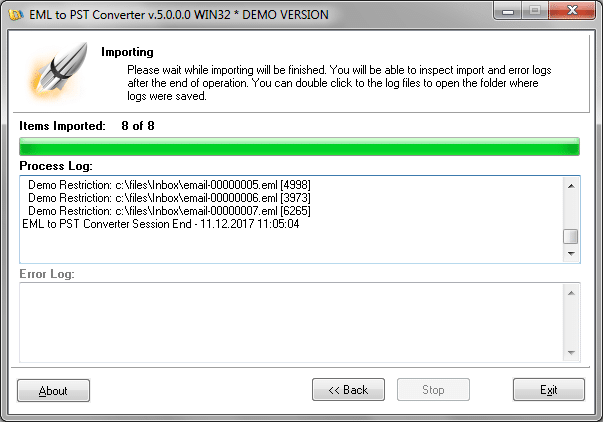 EML to PST converter is a nice and handy utility. It saved me a lot of time and effort. I have couple of archives of .eml files. Each archive was more than 2GB and I had to import them into my email (GMail). I chose to migrate using outlook 2007. As outlook does not recognize .eml files, only other way was to import these into outlook express and then import further into outlook. It was a tiresome process to setup 2gb worth of data with all the folders into outlook express. You little utility worked like a charm and created an .PST file for me preserving the folder structure. Thanks for the great utility. I used the software to copy and convert an mbox email container from an Apple laptop to a PC and convert it to PST format for viewing in Outlook. I needed to migrate my email from Apple to PC. I Was slightly confused as to whether I needed to convert the emlx files in the mbox container (which Windows interpreted as a folder) using mboxtoeml prior to running the program – but five mins of testing clarified the situation, no prior processing required and all was well. Great product! Got me out of a difficult situation quickly and simply – very fast and error free. Keep up the good work. 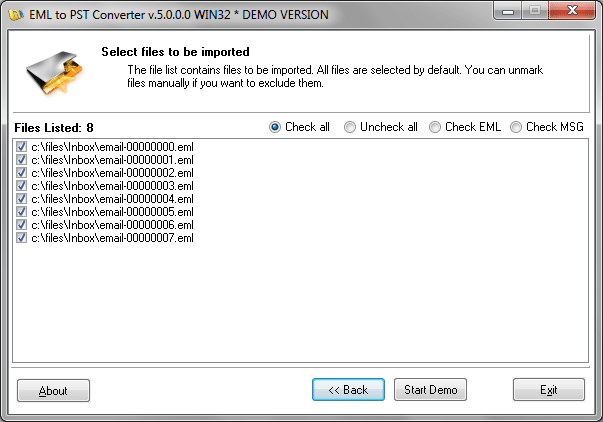 Download and evaluate EML to PST Converter now!